Sometimes, you just need junk food | Mmm, Tasty! One of the stereotypes vegans get labeled with is that everything they eat is healthy. While I will say that many people I know who follow a vegan diet do eat a very healthy, balanced diet, there IS a lot of junk food out there. I mean, come on, look at Vegan Cupcakes Take Over the World and Vegan Cookies Invade Your Cookie Jar. And of course they are tons of vegan snacks out there – chips, popcorn, candies, chocolate, and so on. Yes, you have to be careful that the ingredients are actually vegan, but still, my point remains: being vegan does not mean healthy eating all the time. Which brings me to last weekend. See, Rich had a craving for poutine. Prior to discovering my milk allergy, this would have been a really easy thing for us to make at home. But then I had to eliminate cow’s milk. Well, no problem, there’s some pretty decent goat’s milk curd out there! But… vegan poutine? Would that really work? I searched the internet for recipe ideas and realized that everyone came to the exact same conclusion I did: Take french fries. Take your favourite vegan cheese substitute. Take vegan gravy. Combine and eat. Just like this video suggests. Ok, so my version was less, umm, fancy. I bought store bought fries and put some Follow your Heart mozzarella on top in the last few minutes of baking, then made my own vegan gravy and combined it all to eat. 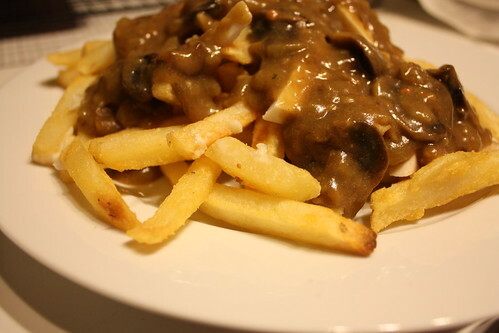 Now, there’s no pretty way to photograph poutine, but here’s proof we did it, in all its gravy smothered glory. It was quite tasty! Admittedly, it was missing the squeakiness of fresh cheese curds, but it tasted good and certainly had that Friday-night-junk-food feel to it. So I’ll call the experiment a success.